Michael Lund Pedersen’s Mucho Gusto put his name among sophomores to watch with an impressive tally in the February 2 Robert B. Lewis Stakes (G3) at Santa Anita Park. The $625,000 son of Mucho Macho Man powered clear to a third win from four lifetime engagements, while also picking up 10 points on the Road to the Kentucky Derby for his efforts. Mucho Gusto started his career at Los Alamitos in September and served notice that he was a top prospect following a four-length romp as the even-money choice. The Kentucky-bred jumped right into the deep water following his debut triumph when facing four foes in the Bob Hope Stakes (G3) at Del Mar. Breaking alertly in his stakes bow, the chestnut led at every call while under pressure and inched clear late to post a 1 1/2-length triumph under regular pilot Joe Talamo. His next assignment came in the Los Alamitos Futurity (G1), where the youngster led turning for home before being outmatched late by the super-impressive Improbable, ultimately finishing a clear runner-up. Mucho Gusto has a lot going for him right now. The way he re-broke when encountered in early stretch at Santa Anita in the Lewis was among the more visually impressive moves that I have seen early in the season. He is proven to be a high-class performer over multiple surfaces, at two turns, as well as on both fast and sloppy ovals. The fact that he is in the hands of the incomparable Bob Baffert is obviously a positive, too. Mucho Gusto shows solid BRIS Speed figures of 90-92-95-95 to this point with obvious room for improvement. This speedy sort has always been full of pace, though he did rate kindly in the Lewis and still powered home in a professional manner. From a pedigree perspective, Mucho Gusto appears to be cut out for classic distances. His sire, Mucho Macho Man, finished third in the 2011 Kentucky Derby (G1) and later in his career annexed the 2013 Breeders’ Cup Classic (G1). Mucho Gusto’s dam, Itsagiantcauseway, is by stamina influence Giant’s Causeway out of a mare by Seeking the Gold. This is the same female family that produced Canadian Horse of the Year and multiple Grade 1 winner Peaks and Valleys, among others. Mucho Gusto checks a lot of boxes as a Triple Crown contender – speed, form, class, top human connections and a suitable pedigree. 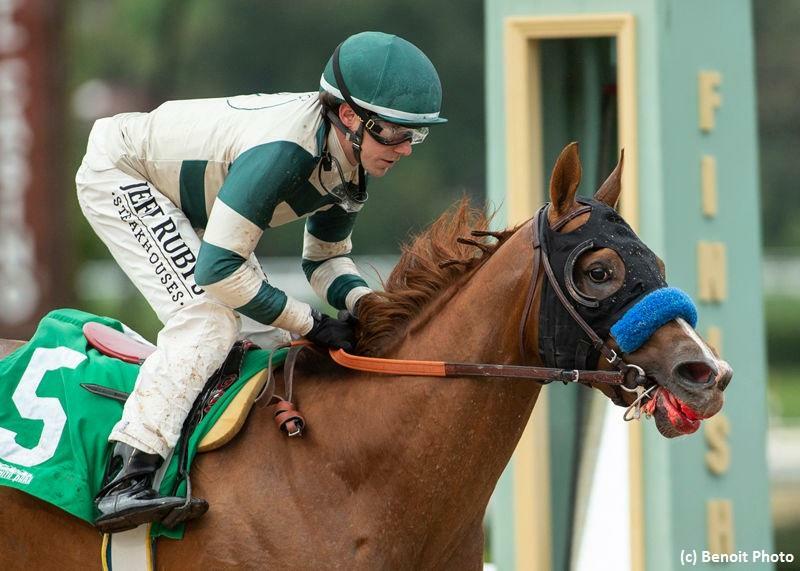 The colt is surely one to watch as he progresses on the Road to the Kentucky Derby.